I’m disturbed by the some of the animosity within NAMI that’s reflected in the comments on your website. We ought to be colleagues who accept one another’s opinions (agree to disagree) rather than being adversaries. Surely, as people who have been in the trenches of discrimination and stigma, we are the best at accepting and celebrating difference. In addition to her NAMI work, Kathy Brandt is a published novelist and accomplished scuba diver whose mysteries feature an underwater crime scene investigator. When I met her last year, she told me that she and her son, Max Maddox, where writing a joint memoir entitled Walks On The Margins. In their non-fiction account, Kathy and Max write alternating chapters — she writes from a mother’s perspective about mental illness and Max describes his experiences as he works his way through psychosis into recovery and eventually learns how to manage the symptoms of bipolar disorder. I’ve just read an advance copy of their book and mother and son are both skilled writers. They’re also painfully honest. I felt a sense of deja vu reading their memoir. I happen to finish reading Walks On The Margins at about the same time that I wrote my blog about NAMI’s changing face and was struck by two simple, but important thoughts. 1. We are in this together. Parents or consumers or both — we are all family members. 2. Strong opinions about forced medication and involuntary treatment might divide members but those issues are not what brought most of us into NAMI or why we belong to it. Most of us attended our first NAMI meeting because we needed help, advice and support. Kathy captures both points in the memoir that she has written with Max. She gave me permission to publish two excerpts that I found especially poignant about her relationship with NAMI. I will write more about the book and will include excerpts from Max’s journey in a later blog. But today I want to share with you what Kathy wrote about NAMI. On the night before Valentines Day, I attended a health forum organized by several non-profits in the community. I wasn’t exactly sure where I fit in and contemplated leaving when a woman recognized my discomfort and asked me to join her discussion group. Gayle introduced herself as the coordinator of a program called Family-to-Family and the mother of a son with bipolar disorder. Others joined us, a woman with a sister and parents with a son, both with paranoid schizophrenia, a wife whose husband suffered from PTSD. And me, mother of a son with Bipolar I. Gayle began by telling us about her son, thirty eight, working, and on his own. Others followed with one painful story after another, stories about crisis, destruction, fear. The ones we loved were no longer the people we had always known. I told them that Max was out on the street somewhere, delusional and fully lost in his imaginary world. As the meeting broke up, Gayle walked me to the door and handed me a pamphlet about her organization, the National Alliance on Mental Illness, which she called NAMI. For a while inside I felt less lonely, relieved to be talking with people who knew what it meant to cope with mental illness, people who were willing to listen and help each other. But out in the dark, I recalled the look in Gayle’s eyes—experience and empathy, but also deeply buried grief. Several chapters later, Kathy again mentions NAMI. openly about their experiences. As the weeks past, we told stories about hospitalizations, financial ruin, and destroyed families. 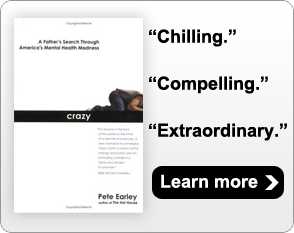 Stories of bipolar, obsessive compulsive, and borderline personality disorders, schizophrenia, depression and post-traumatic stress. These were the wives and husbands, mothers and fathers, brothers, sisters, daughters, and sons. She was contemplating divorce and this class was her last ditch effort to figure things out. An older woman in the class, a retired teacher, had been taking care of her son for forty-two years. He had paranoid schizophrenia. Her adult daughter sat quietly beside her, knowing that at some point she was going to have to take over her brother’s care. After so many years, her mother had accepted her son’s limitations and behavior. She’d given up trying to convince him that he didn’t need to duct tape the seams around bedroom windows and spray for insects. After years of experimenting with medications, she believed this was the best it was ever going to be for her son. Sometimes medication and a caring family simply couldn’t help a person become what we once hoped them to be. I told my story too. That two months ago, I had been preparing for the worst—that Max would be incapable of living on his own. I knew it was risky to look too far into the future. Before he got sick, I assumed Max would graduate from college, maybe go on to graduate school, find a fulfilling career, get married, and maybe have kids. He had already accomplished so much, but I knew his road would be harder and more complicated, and that he’d continue to follow a crooked and unconventional path. By the end of our twelve week class, many had let their anger go and quit blaming their loved-ones. And we’d stopped blaming ourselves. We’d accepted the “new normal” of life with mental illness. We left that last night with two-inch thick binders filled with information about mental illness, about what to do in a crisis, and how to communicate, problem solve, and take care of ourselves. We’d become educated and empowered. We’d learned that recovery was possible and that we weren’t as alone as we’d once thought. By the year 2014, I will have spoken in every state except for Mississippi about the need for mental health reforms and the increasing problem of how our jails and prisons are being used as asylums. What Kathy has written is representative of what I find whenever I visit NAMI groups. Most members are not ideologs. They are moms and dads, brothers and sisters, children and parents, grandmothers and grandfathers, brought together by mental illness. Regardless of its achievements and shortcomings, those individuals and their desire to help each other is the heart of NAMI. I agree with you. I spoke to the the local NAMI group in the mid-80s, my wife did Family-to-Family in the late 90s when I had the worst of my troubles, and I was the local president in 1999-2000, a NAMI Ohio board member. I’ve done a lot of writing, web and media work for local groups. As you say, these local groups are important. Information about mental illness is not accessible to people outside of groups like NAMI. The person-to-person work is extremely valuable. A supportive community is a powerful resource. And we have families for a reason, to protect and support each other, and even out our strengths, vulnerabilities, economic and emotional resources. The national NAMI has struggled finding an independent role or stance in light of its institutional and economic needs. The thing runs on money, not kindness, and clearly at some point it started taking too much from pharma. People at the center were gullible or got suckered by the marketing for drugs that did not pan out. Today NAMI’s medical writing is better. It has its organizational culture issues. But at its heart it truly cares about vulnerable troubled people, which is a far cry from many other groups and the population at large. the heart of our disagreement with a huge organization like NAMI, is that, while perhaps helpful on a personal level by connecting families to share and understand the devastation of mental illness, the fact that conditions like rampant homelessness and lengthy jail terms, often in solitary, often for children, often without medication or representation, exist as perfectly acceptable outcomes for an illness and are seldom addressed by NAMI; they are our public voice, our biggest organization to date that i’m aware of, that could help pressure and initiate the radical reform needed–toward proper treatment methodologies, more standardized paths forward and accessibility to medical help for brain disease patients–and they do not. it astounds me that one never hears their voice publicly after a personal tragedy; that the parent groups are filled with awful stories of bankruptcy, family ruin, lives lost to streets and jails, of quackery and hopelessness for patients, of 40 years of care at home, with unskilled parents and care takers. these are medical conditions. it seems as if NAMI has abandoned the most severely ill to these conditions and policies and has let the legal system bear the brunt of the responsibility for a desperately sick clientele. other brain patients, alzheimer’s, dementia, brain injury, autism, stroke patients, do not run these risks with the certainty that we do; why is NAMI content (as it appears so) to allow ruinous policies, limits on insurability, closings of psych facilities, lack of qualified doctors and psych beds, lack of access to care, lack of laws to assist patients in staying well? it is NOT ENOUGH to comfort parents and increase understanding and public awareness. the system continues to erode, and not in our favor, and now stands clearly designed to MAKE YOU FAIL. NAMI should be horrified at every story they’re hearing, not merely increasing support for families. change must occur. as far as i can see, sincerely, they have no interest in pushing that change forward for any of us. with the number of state branches and supporters they have, they could send a small army to every single arrested person’s jail house, to every single court hearing over victims like Kelly Thomas, to every single teen’s trial as an adult after a violent incident, to really be vocal throughout our a nation in saying exactly what needs to be said: Enough Tragedy! We Must Have Treatment! Change this system! Reinvent and Rebuild our Health care for SMI! Give us Solutions, not more horror stories to accustom ourselves to and grieve over in parent meetings. Medical solutions are here, they are within our reach; they are quantified and evidenced based; they have research and results behind them; Early Psychosis Intervention. Better Medicines and Medication Management; Quality, long term therapies to reconstruct the personhood. Assisted Outpatients Laws. Low cost, supervised, safe housing. Custodial care has been decimated, and while very imperfect, at the very least it kept people from dying of dehydration under a bridge some where. There are answers to our horrible dilemmas, but they are not being backed by NAMI. It’s foolish to believe every single person who develops SMI can be maintstreamed and productive; agnosonosia, treatment resistance, meds that fail….These are drastic illnesses. Yet, there are NO medical solutions in place any more that provide long term care, or even enough time in a hospital with medical treatment to regain competency; there are now many many homegrown “programs”, to the tune of 10’s of Thousand’s of self-paid dollars, unregulated and ineffective and not under any medical direction at all. NAMI must be as interested in the change and rebuild of this system as it is in supporting awareness and family understanding. Without that, the quagmire and horror continues, unabated. Thank you Laura as always for your brilliant way of cutting it down. There must be a new voice and a new sense of radical respect for those who don’t know anything about NAMI or its heart. Yes, NAMI members are well intended volunteers teaching about navigating the fragmented, underfunded, discriminatory system and offer support but we need more. We need equity. NAMI accepts the status quo to get funds and they don’t rock the boat. We need to rock every boat in every county of every state. NAMI’s heart must start beating for all and its national voice must start speaking forcibly against treatment by jail, bus, the streets or many of their elderly members back bedrooms. The beef with NAMI is due to their dissemination of incorrect information, dated science, and dysfunctional policy. If you are talking about suggesting they look into whether their family member would fit the criteria for Assisted OUtpatient Treatment, please explain why you think this is a bad idea. given the person is clearly sick, not seeking treatment on his own and landing in jail because of it. If you don’t agree with AOT…what would YOU do to help that person get the treatment they need – any treatment…not just meds…and AOT is not just about meds, btw. I think there is a learning curve for all of us (family members and loved ones with brain diseases) involved in NAMI. NAMI offers education, support and advocacy for all. NAMI is there to help as best as it can. When I attended NAMI’s Family-to-Family course, my daughter was going through her fifth involuntary hospitalization in nine months because she lacked insight and would stop taking the medications that helped. What I learned from the class was that everyone was exasperated with trying to find help for their family member. I didn’t want to just share our common problems, I wanted to change a very broken mental health system and became an advocate for assertive community treatment (ACT). At that time NAMI National was very supportive and used to have several workshops on ACT at their conventions – they don’t anymore. It took a couple of years to have ACT in my county as the local consumer groups were against it. My next attempt to help individuals like my daughter who are too ill to seek treatment on their own was to advocate for improved AOT laws I’m my state. Consumer groups have successfully blocked that effort and NAMI has been of no help at all. So, if all you want from an organization is to learn about mental illness and support others experiencing the same failures of our broken mental health system then NAMI is for you. However, it is a shame that NAMI doesn’t support individuals with the most severe mental illnesses and their families by advocating for better services like ACT programs and better treatment laws like AOT. Thank you! MHA is the organization responsible for fighting AOT laws…I got an email from them telling me to call my governor to oppose the changes to Kendra’s law before they were made…and the same day got an email from NAMI (NY NAMI does actively support AOT – National leaves it up to the individual states though) urging me to call the governor to support the changes! I want to lock these groups in a room – NAMI, MHA and TAC – and not let them out until they agree on how to help people with anosognia get the treatment and supports they need – and work at one voice to make that happen. Support groups such as NAMI’s, A.A., or the hundreds of others offered in communities around the nation have their place and can be helpful for the many life-crisis-sudden illness many of us encounter. I am a small family of two. Myself a longtime recovered victim of mental illness, my family member struggling with mental health issues, mostly untreatable. I recently sought out a family to family support group run by NAMI, and was told I could not participate. One of the reasons was because i have an MI, and the group is strictly for families of the diagnosed. I am both family of, and a person w/ MI diagnosis. What a shame – I have no extended family loving and supporting us. I was discriminated against by NAMI. Many people with mental illness become parents, and sometimes (according to scientific probability, 50%), those kids become mentally ill, as well. Like they say, the world is not fair and it never will be Some of the best at stigmatizing come from within the ranks of health care, and unfortunately, the very ones whose family members have mental illness. Its nice that these large well funded national mental health groups attempt to do something – but at the end of the day, for me, and all the others that y’all say you want to help, we have ourselves to pull us through. We don’t look to big groups, we help and advocate for eachother, we stand up to the doctors, we educate the lawyers and judges assigned to us, we speak up to employers and coworkers who harrass us, we explain our symptoms to people who are nervous around us, and for all of those never-be-wells that are locked up or shut in for life, we are the last to condemn them.. This is more than a disagreement within NAMI, it is a huge reason why many who need help desperately will never turn to NAMI. I know that when I first faced the reality of a teen with Schizophrenia, I went to the NAMI website. I could see that there was no help there for me. Faced with either CPS taking my younger children or turning my teen out on the streets, I needed answers, not pie in the sky. I soon learned that no one, and especially not NAMI was there to help either me or my son. NAMI is great at the basics…supports for family members. But they have become a huge organization and there are problems that go with that. They are a very bureaucratic organization. I have attended every National Convention for the past four years, and was a guest speaker at last year’s convention on Olmstead. NAMI really doesn’t address the needs of this forgotten population. My brother was one of them. At least they don’t talk about them in any significant way during their conventions. IT is all about this rah-rah – “Recovery is Possible”. chant…That is my big beef with NAMI.